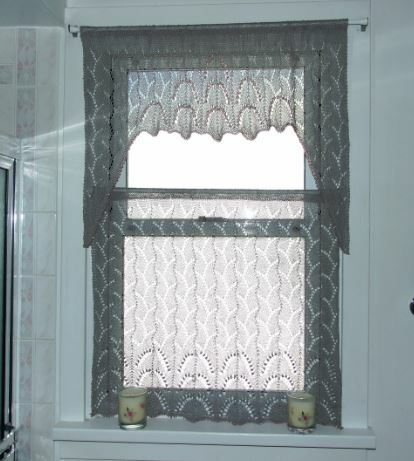 Not long ago, I posted the photo and pattern of the bathroom curtain set I designed. Since that time I have had over 700 uploads of the pattern. As a result, I have also had a request for a larger version. To that end I have designed a 60 inch valance for those of you who have larger windows to cover. It should go nicely with a 36-48 inch window. Why only the valance? If you make the valance first, the fullness and drape will let you know if you want the bottom panel larger or not. 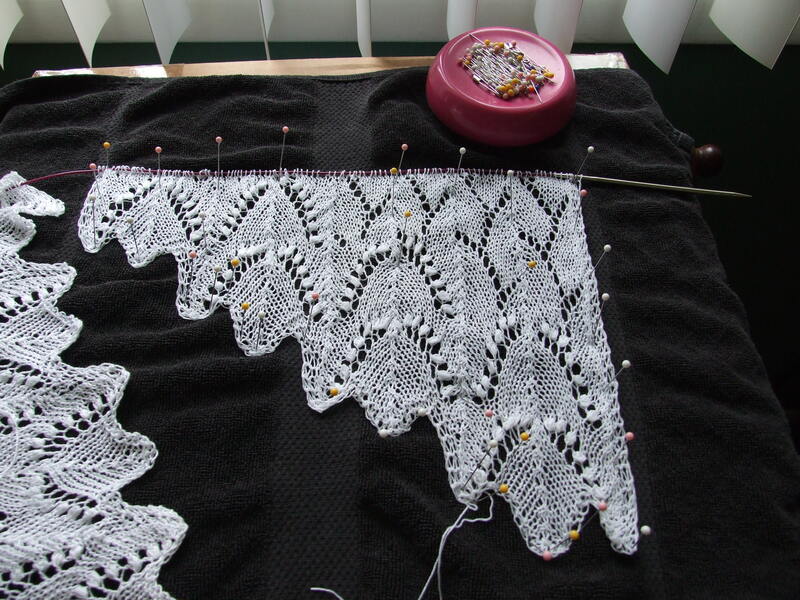 You will get the full affect of the lace-and you might not even need to knit a bottom panel, the valance might just do the trick nicely. I have included the original chart for the bottom panel in this tutorial. 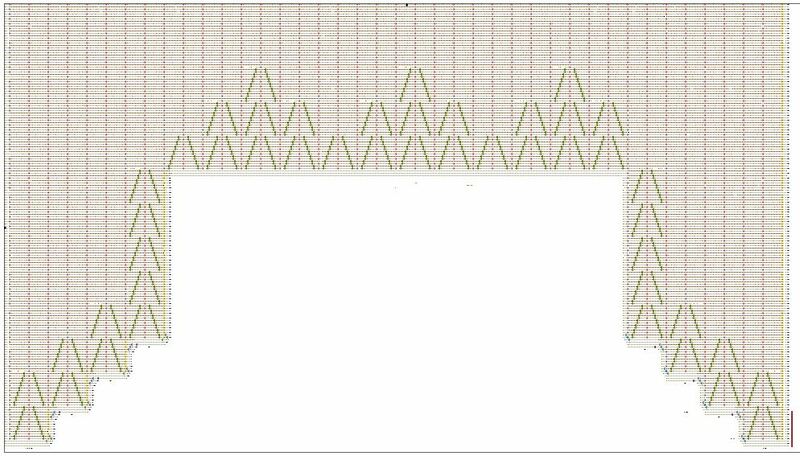 Below is a graphic of the valance chart. It gives you a feel for the overall design. This chart is for a 60 by 30 valance. Each side panel is graduated toward the center. The original center panel has been expanded two extra repeats. The possibilities are endless. You could continue adding the Lilly of the Valley arches to the side panels, blending them in to the center. Each side panel in this 60 inch version measures 12 -13 inches, including the 3 stitch border. Each added arch equals approximately 3 inches in width. If you needed a 72 inch version, you simply add two extra arches to the side panels (6 inches on both sides). 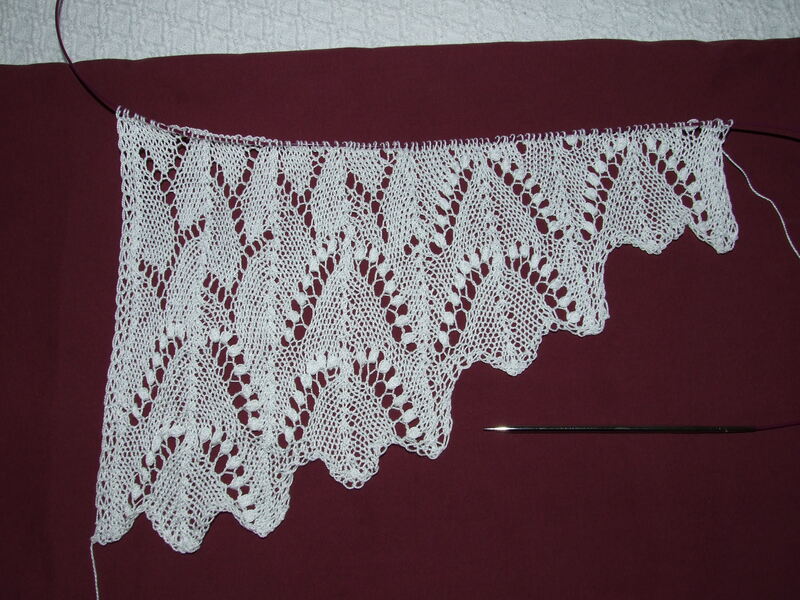 You can also add to the length of the side panels by adding on or two extra vertical arch repeats. You also have the option of adding to the top as you knit you Stockinette finish for the casing. There are 4 files in this pattern because of the size. The first one includes instructions and chart symbols. The last 3 are the charts for each section. *Note- I did not write instructions for every row, only those that need extra explanations. These rows are starred in red on the right side of the charts. The rows are also number, and each chart has the corresponding numbers to the others. The chart symbols are explained in the tutorial. I have also illustrated special techniques when necessary. Of course my brain is just full of creative possibilities for this type of project. Pictures of flowers, animals, scenes from nature- hum…………………………………?